DDclient is a service used to update dynamic DNS entries on many services. It is useful if you need a DDNS client that can work with pretty much any DNS service. Most distributions provide DDclient in their official repositories. It is available on Debian-based systems, Fedora, Archlinux, and many more. In my case, I need DDclient for my NextcloudPi server that runs on a Raspberry Pi 3B hooked up to a storage device. This server gives me access to my files anywhere anytime as long as it has a working internet connection. I’m using a free DNS service from Dynu and in their website, they go in details of how you would set up dynamic DNS using DDclient. It turns out that they use a dyndns2 protocol by www.dyndns.com to provide this service. Now after installing DDclient, the client can configure it under /etc/ddclient.conf where you can set the update interval, server address (in this case dynu.com), username and password, etc. As you can see I’m using dynu.com server. Different DNS services would have different configurations. If you ever played retro games on modern computers, then you probably know what an emulator is. Chip-8 is an interpreted programming language that was created originally by Joseph Weisbecker. Chip-8 programs get interpreted by a virtual machine. 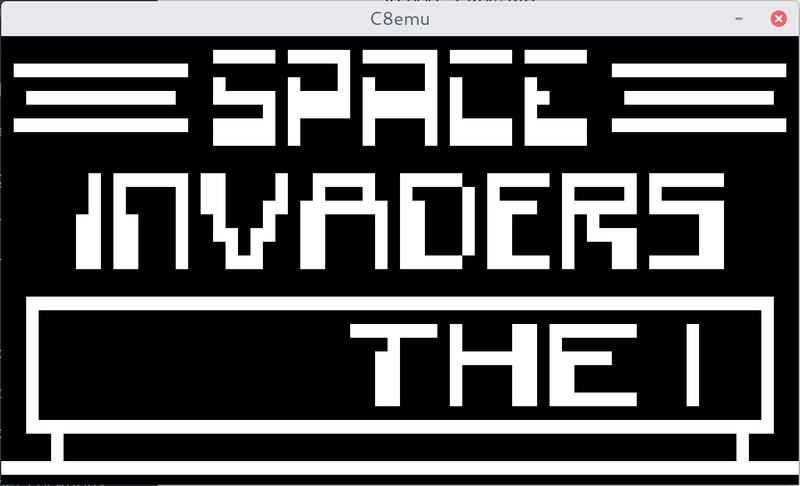 It offers a very simple monochrome graphics and uses a 4Kb of memory. It has the “8” part because all the system’s components, like CPU registers, have a size of 8 bits or 1 byte. These three steps happen in the CPU which is the main component of a system. The first step is to read operation codes from the program, then the CPU tries to decode these codes and then executes them accordingly. Before you get very excited, you really have to understand how the system works and behaves. Get familiar with your binary and hexadecimal conversions. A hex viewer may come handy when debugging a program. Chip-8 is a simple system that has 16 CPU registers, each takes information up to 8 bits (1 byte). The program counter, I register, opcode placeholder, and a stack pointer, all have a size of 16 bits (2 bytes). Memory is a 4Kb memory where the first 512Kb is reserved for the interpreter which, this makes most programs written for the Chip-8 start at location 512. A minimal of 16 level stack pointer is required and it is used to store return locations from the program counter register. There are two timers both countdown from 60 to 0. Delay timer is used for program events and its value can be set and read. And a sound timer which plays a beep whenever it reaches 0. After every operation execution, both timers get subtracted by 1. Usually ‘2’, ‘4’, ‘8’, and ‘6’ are used for directions. These sprites should be stored in the reserved interpreter area 0-512 of memory. Input and graphics depend on the libraries you will be using. I went with SDL2 for these two since it is cross-platform, very well known, and has a lot of documentation. You can refer to my Chip-8 implementation here. Well, I really learned a lot from this project. Next, I want to extend this project to have a terminal based UI using ncurses. Or maybe work on a more complex system like the NES? In systemd 239, they have added a new service that handles suspending then hibernating after a given amount of time. This is easier than using external scripts since it comes built-in with this version of systemd. You can check systemd version with systemctl --version. Here, what we care about is the last line HibernateDelaySec where you can define delayed time. As you see, I have it set to 15 minutes after suspending. This will make systemd executes suspend-then-hibernate instead of suspend every time suspend is invoked. Obviously, everyone was born before the year 2000 knows the famous classic game ‘Minesweeper’. To me, I knew this game when I was little at the time where Windows XP was ruling everywhere. It is funny because at that time I did not know exactly how the game is played. That time the game was some kind of a luck game to me where you try to eliminate all the squares except the ones with mines until you either win or lose . Until recently, a friend pointed out that they saw a video of a guy who made a fully perfect AI to solve the game. I liked the idea so I decided to make one. I started by learning how the game works and it turned out to be very simple. There is a certain number of mines in the game and the player has to discover where these mines are to win the game. Every square has a weight that shows how many mines they are within the surrounding 8 squares of that particular square. If the weight was zero the game will reveal all the surrounding squares except the ones with the mines, otherwise, it will reveal the square itself. Although things did not go very well with the idea, I ended up making the game only. This will create a square with side equals to 10 and a position of (0, 0). Easy and simple. The game does not have a loop, it contains two main functions. The first one is called to initialize the game environment like setting mouse event handler. Here is where all the magic happens, whenever the user clicks the first click the timer starts and it passes the click to the game. If it was inside the game frame where the squares are located it will register a click for that square. Otherwise, it will start a new game. Which is the second function, the previous function is only called once. This one is called to clear all the previous data in the game and create a start a new game. Obviously, this is done with the help of other functions to make it a little more organized. The source code is available at JSMinesweeper or you can try it out here .